Few wineries in the United States can give you the taste of history, for better and worse, like Charles Krug. It's all there: the world-class wine made in California before outsiders realized it was possible; the hardship wrought by a bitter lawsuit between brothers; the slow rebuilding of vineyard sources; the modern move toward ever-riper wines. I attended a vertical tasting of Charles Krug's top wine, Vintage Selection Cabernet Sauvignon, last week at the winery. The experience was fascinating partly for the wines themselves -- some were so delicious that I lingered behind to finish my tasting portion -- and partly for the glimpse at Napa Valley history. The Mondavi family's history has been entwined with Napa Valley's since 1943, when Cesare and Rosa Mondavi assented to their son Robert's ambition and bought Charles Krug. So let's go through the wines in chronological order, the way we tasted them, for a history lesson. 1964: Brothers Robert and Peter Mondavi were not getting along, and had not been for a while. Robert, the marketing wizard, was chafing to do greater things that would prove Napa Valley was a world-class wine region. Peter, the winemaker, just wanted to make decent wine and have his brother sell it. At the time, Charles Krug had vineyard sources as good as any in the Valley. Peter Mondavi Jr. said about 45% of the grapes for the '64 Vineyard Selection Cabernet came from the family's holdings in To Kalon vineyard, which was well-regarded even then. Peter Mondavi Sr. also was one of the first winemakers in the U.S. to use French oak, which he discovered on a trip to France with André Tchelistcheff; this was one of the first wines to showcase it. The wine, Charles Krug Vintage Selection Napa Valley Cabernet Sauvignon 1964, was just 11.4% alcohol! It's still hanging in there. The aroma is delicate, like spiced, dried plums. The depth of flavor on the palate is surprising, with dried plums and Christmas spices and good length. It's lovely 54 years later. Hold that thought. We next tasted the wine that eventually became the star of the vertical, the '66. This was an auspicious year for Napa Valley but not in a way that usually sounds good for Peter Mondavi and Charles Krug. In 1965, Robert and Peter Mondavi had a fistfight and Robert was ousted from the family business. He still lived in a small house on the Charles Krug property, and tensions were high. 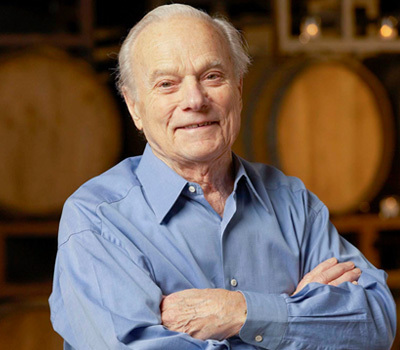 In '66, Robert Mondavi started his own winery, and it quickly became the most ambitious winery in the world. Robert had to have all the newest equipment and the brightest winemaking talent. But Robert also received a letter from the family attorney telling him his connections with Charles Krug were over and he got just $2,000 severance pay. Their mother, Rosa Mondavi, had decided to side with Peter in the family feud. That also meant no vineyards: For the moment, Peter Mondavi and Charles Krug still had the To Kalon fruit to work with. Charles Krug Vintage Selection Napa Valley Cabernet Sauvignon 1966 is about 88% To Kalon fruit. It's brown in color, almost muddy, and it takes a few minutes in the glass to brighten up. But it soon does, and it's outstanding: dried plums and berries, spices, dark chocolate, good depth and just 12.8% alcohol. "Dad was a nut making sure it had good acid levels in the wine," Peter Mondavi Jr. told us. I'm adding some things about Robert Mondavi from Siler's book, but one of the most heartwarming aspects about last week's tasting is how much Peter Mondavi Jr. talked about his uncle Robert. Robert and his children and their children were included on a family tree; Peter talked about seeing Robert and his family playing in the house when he (Peter) was little. Before 2005, this would not have happened. Peter and Robert publicly reconciled their 40-year feud at Auction Napa Valley. Having been there to witness their handshake was perhaps the greatest moment of my career as a wine writer. Alycia Mondavi, Peter's niece, says the family has holiday meals again together since the reconciliation. That's the happy ending to the family drama, but 1974 is the very unhappy middle act. Peter and his mother had booted Robert from the family business with no stock, no ownership, nothing. He filed suit in 1972; Peter's side countersued in 1973, and the tension was worse than ever. Also, the books were open. By 1974 Robert Mondavi Winery had all the good press and attention from the wine world, but it was losing a lot of money, while Charles Krug was profitable. Peter made enemies in the 1974 harvest when he decided to break grape contracts and pay farmers less than agreed. If you think this wasn't a big deal, let me tell you that I heard a heartfelt complaint about this action from a grower more than 35 years later. One of the lots that I hope he paid full price for was Lot F1 from Fay Vineyard, one of Napa Valley's best regarded vineyards at the time. 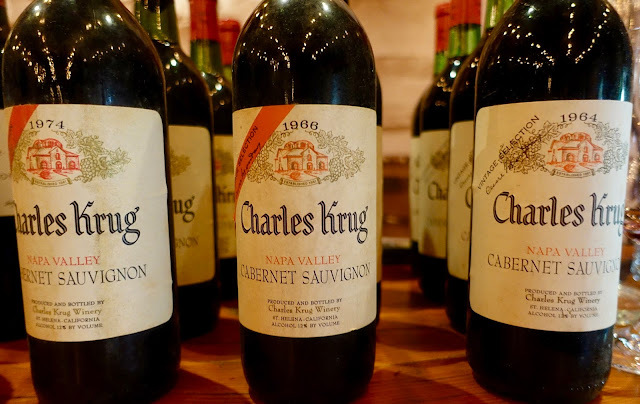 Charles Krug Vintage Selection Lot F1 Napa Valley Cabernet Sauvignon 1974 was the only single-vineyard wine of the ones we tasted. That should also put the era in perspective. Making a single-vineyard wine was still so unusual that the bottle doesn't refer to it that way. The first bottle we tried was corked, but the second was vibrant, with a surprisingly fruit-driven nose and some delicate floral notes on top of a rich palate. It's well in balance at 13.2% alcohol and seems like it can last for years, though if you're one of the lucky people to buy those 3-packs you could just drink it. In 1976, a judge sided with Robert Mondavi in his lawsuit and ordered Charles Krug sold and the money split. In 1977, Peter dropped his appeals and turned over $11 million in cash and properties -- including most of his To Kalon vineyards -- so he could keep Charles Krug. That may not sound like a lot of money now, but it was huge for a winery in the '70s, and it's amazing that Peter and his side of the family were able to keep Charles Krug running. But it was not without sacrifices. Peter Mondavi had to keep his head down and keep cranking out decent affordable wine for years, while Napa Valley around him got ever more ambitious. 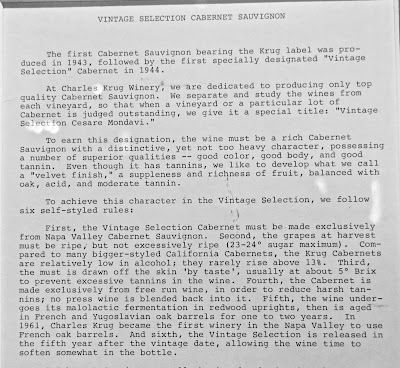 Charles Krug Vintage Selection Napa Valley Cabernet Sauvignon 1983 was, Peter Mondavi Jr. recalls, a tannic monster when they made it, so much so that they stopped selling it for a while. That should tell you something about how tannic it was in an era when Peter's side of the family needed to keep making money. Now, though, the wine is in a beautiful spot: expressive, with fresh red plum and hints of pomegranate. It's just 12.5% alcohol. The tannins are noticeable but they have mellowed. It was impossible for me not to taste this wine and think of it as a metaphor. Let's talk about alcohol. Alycia Mondavi said her grandfather Peter tried to get higher alcohol -- 13% or so -- on those wines in the 1960s, but with the older rootstocks, the way they farmed, and cooler global temperatures, they struggled to do it. "Back then they tried hard for more alcohol," Alycia said. "Then he became one of the biggest advocates for lower-alcohol wines. There were always two topics you didn't bring up with my grandfather: Politics, and alcohol level." By 1991, Peter had a new regular source he liked for the Vintage Selection, Slinson Ranch in Yountville. Charles Krug Vintage Selection Napa Valley Cabernet Sauvignon 1991 (13.9% alcohol) is still fresh and somewhat herbaceous, because it was made a few years before that became verboten for a Napa Cab. There's lots of tannin but it has mellowed, and the wine feels like it hasn't yet reached its peak. We tasted a Charles Krug Vintage Selection Napa Valley Cabernet Sauvignon 1998 (13.7% alcohol) from a famously rainy vintage that is generally holding up well now. I heard a chorus of approval around me, but I did not like this wine: it was quite oaky and it seemed to me to be an attempt to cover up what was seen as a poor vintage. The last wine in the upcoming three-pack, Charles Krug Vintage Selection Napa Valley Cabernet Sauvignon 2003 (13.6% alcohol), is the first sign of how Napa Valley was evolving. The earlier wines had been 100% Cabernet, but this is a five-grape blend that includes 1% Syrah. "We had a French consulting winemaker and he suggested we add a little Syrah," Peter Mondavi Jr. said. "We were shocked by that. Historically in Bordeaux they added a little Syrah during the lighter vintages. It wasn't legal but they did it. Now we're back to being more purist than that. We don't add Syrah anymore." The wine was the most fruit-driven wine we tasted and shows a change of style, but it is quite good at what it wants to accomplish. An appealing aroma of black and red berries with hints of violet and chocolate leads to a rich black-fruit palate without overripeness. It's quite lively and should continue to improve for a while. Then 2005 happened, and the Mondavi family reconciliation. That's the happy ending. Now comes the hard part. I get tired of writing this story, but it is the key observation. We tasted the yet-unreleased Charles Krug Vintage Selection Napa Valley Cabernet Sauvignon 2015. It's 15.8% alcohol and it tastes like fruit vodka. We had all these delightful wines in a row, and then this. Reader, I was not the first in the audience to ask why the style had changed so much. Peter Mondavi Sr. died in 2016 at age 101, but he had given over the winemaking reigns years before. Stacy Clark became Charles Krug's winemaker in 2011, and she said, "I had some discussions with him (Peter Sr.) about alcohol." 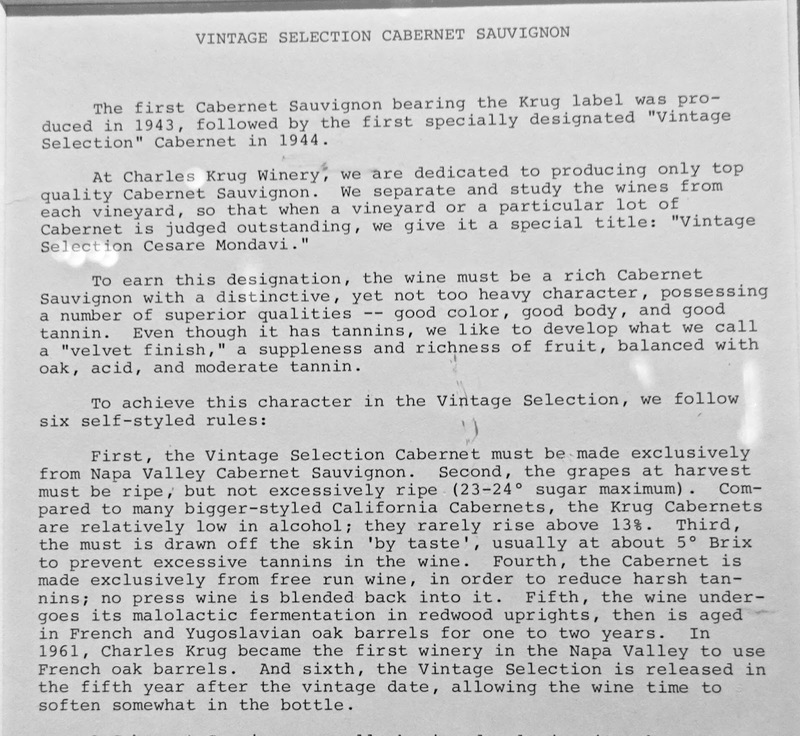 Downstairs in the hospitality center, opposite an impressive display of older vintage bottles of Charles Krug Vintage Selection Cabernet, there's an unsigned description of what the wine is supposed to be. It reads in part, "The grapes at harvest must be ripe, but not excessively ripe (23-24° sugar maximum*.) Compared to many bigger-style California Cabernets, the Krug Cabernets are relatively low in alcohol; they rarely rise above 13%." Karen MacNeil, author of The Wine Bible, made wine journalism proud with this snippet of conversation. Karen: "This (2015 wine) is a real departure from the philosophy of Peter." Stacy Clark: "The valley changed in the '90s." Karen: "I'm not asking about the valley. I'm asking about you." Peter Mondavi Jr.: "It's an evolution over time, partly driven by the vineyards. Very healthy vines, they're little sugar factories out there. You get these healthy, virus-free vines, they're very efficient producers of sugar whereas the physiological flavors of ripeness still develop at the traditional rate. We're not advocates of high alcohol. I don't like the fact that we have high alcohols. I'd like to get it lower. I'm not an advocate of artificially lowering the alcohol. If it is a higher-alcohol wine, I'd like it to be balanced. I think these wines come across as balanced and people are often shocked when they learn the alcohol is 15-whatever." Blake Gray: "Do you see high alcohol as an issue you want to address? Do you want to make wines with lower alcohol?" Peter: "I'd love to make wines with lower alcohol. I just don't see the natural mechanism to do that right now. I see some Napa Cabs coming off of that overripeness and they introduced subtle amounts of herbal characteristics moving in as they're picking with less maturity. The wines you pick today at 23 or 24 (brix), I think you'll have bell pepper (flavors)." I had a discussion with another writer after the event. We lamented that the next generation of wine writers will not have many opportunities like this in Napa Valley, or indeed in many wine regions in the world. Peter Mondavi believed in acidity as a preservative of the wine, and he was right: his older wines are still beautiful, and he lives on through them. It's hard for me to believe that the riper, lower acid wines of today will be delicious in 15 years, let alone 50. Maybe that doesn't matter. I loved that 1966 Charles Krug Vintage Selection Cabernet so much that after the tasting proper was over I surreptitiously drank it, rather than sipped it. But it was a bottle of wine kept for just such an occasion: to be poured in tiny portions for a couple dozen journalists and sommeliers. It isn't what most people are really drinking now. I'm glad to have attended this tasting for a number of reasons, but the greatest might be that I had a taste of how well Napa Valley Cabernets could age. This is the same reason that, when I became more concerned about global warming, I started visiting glaciers. There are a few bottles of older vintages of Charles Krug Vintage Selection Cabernet available from wine shops, and some cost about the same as a premium Napa Cabernet now. Buy a piece of history before it's gone -- and drink it. Here's the link. Great story, thank you Blake. Question - I know you did not taste every vintage but I am wondering if you know whether Stacy's impact as winemaker was immediate (2011) or was 2015 the vintage the marked the real change in style? It's a good question but I can't answer it because we skipped from '03 to '15. That may have been too abrupt. I don't know if the change happened overnight or gradually. "Older California Cabernets are within reach at auction"